Under the word “commit,” the ISBE lists passages that use the Hebrew words galal, paqad, natan, and sim (Job. 5:8; Ps. 10:14; 22:8; Jer. 11:20; 20:12; Ezek. 27:24; Isa. 22:21; and Lev. 6:14). Also there are passages where the Greek words paradidomi, paratithemi, and didomi, are found (Lk. 23:46; Acts 8:3; 14:23; Rom. 6:17; 1Tim. 1:18; 2Pet. 2:4; and Rev. 20:4). Then, by way of explanation, it is stated, “In these references, “commit” is used in the sense ‘entrust.’” (The International Standard Bible Encyclopedia, G. W. Bromiley, General Editor, Volume One, p. 751). 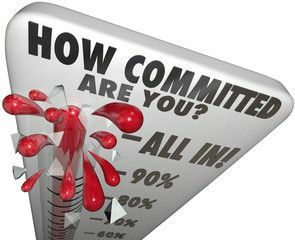 Though the Bible does not contain the word “commitment,” it certainly does have a great deal to say about the concept of commitment. To convey this idea of “a promise to give yourself to support a cause,” The Bible uses words like “faithful” (Lk. 16:10-13), “doer” (Js. 1:20-25), “works” (Js. 4:14-26), “boldness” (Phil. 1:20; 1Thess. 2:2), etc. If we are to become the men that God wants us to be, we must be men of commitment. The story of Louis Zamperini is pretty unbelievable. He is perhaps most well known for being a Japanese prisoner of war survivor. But prior to his war exploits, Zamperini was known as an athlete who took up running in high school and participated for the US in the 5,000 meter race in the 1936 Berlin Olympics. In 1941, he was commissioned into the United States Army Air Forces as a lieutenant. He served as a bombardier in B-24 Liberators in the Pacific. On a search and rescue mission, mechanical difficulties forced Zamperini’s plane to crash into the ocean. After drifting at sea for 47 days, he landed on the Japanese occupied Marshall Islands and was captured. He was taken to a prison camp in Japan where he was tortured. Following the war he initially struggled to overcome his ordeal. In a televised interview on the Christian Broadcasting Network in 2003, Zamperini related that after the war, he had nightmares about strangling his former captors and began drinking heavily, trying to forget his experiences as a POW. While attending one of the evangelistic crusades led by Billy Graham in Los Angeles, he was reminded of his prayers during his time on the life raft and imprisonment, and Zamperini recommitted his life to Christ. Following this, he forgave his captors, and his nightmares ceased. Later Graham helped Zamperini launch a new career as an evangelist. One of his recurring themes was forgiveness, and he visited many of the guards from his POW days to let them know that he had forgiven them. This included an October 1950 visit to Sugamo Prison in Tokyo, where many war criminals were imprisoned, and where he expressed forgiveness to them. Zamperini told CBN that some became Christians in response. Zamperini’s life story has been captured in the biography by Laura Hillenbrand Unbroken: A World War II Story of Survival, Resilience, and Redemption and the hit movie Unbroken. Ruth Jones is another example of one who has a commitment to people. Jones’ work with the Henry Paideia Academy in Grand Rapids, Michigan, has earned her numerous honors, awards and accolades, as well as visits from former Michigan Governor John Engler and President George W. Bush. From 1994 to 2004 she was responsible for taking the inner-city school from the brink of closure, because of poor academic performance to a top-performing institution. Mack White made some very bad choices that landed him in a juvenile justice facility in Texas for three years. While incarcerated he was forced to confront some difficult truths that led him to change his heart and become a more productive citizen. With the help of Mike and Carmen Studer, who asked Mack to come and live with them, he gained confidence and came to appreciate that nothing is impossible if you are willing to face the most difficult truths about yourself. Mack’s story is woven through the movie entitled One Heart. The website says this about the story that forms the basis of the movie and of Mack White’s story that is part of the movie. “Based on the real-life events surrounding a 2008 high school football game, One Heart is the amazing story of the players and coaches from Gainesville State School and Grapevine Faith – two groups from diverse backgrounds whose paths cross to create life-changing hope and inspiration for both teams. Two Teams. Two Cultures. One Heart. “Reminiscent of The Blind Side, Remember the Titans, Hoosiers, and Chariots of Fire, One Heart is a moving story that transcends sports, touches the heart and shows how a simple act of compassion creates a powerful and lasting impact. One Heart demonstrates the power of unconditional love to transform lives. The film is targeted to both adult and teen audiences as well as the family film audience. “At the conclusion of the movie, the audience will have the opportunity to join the One Heart Movement and impact a forgotten population of juvenile offenders. The One Heart Project is a public charity that provides a second chance to incarcerated and at-risk youth, through service partners in communities across America, by connecting those activated by the movie. “Mack White experienced first-hand what it is like to be a part of the “cradle to the cage” pipeline. Mack was born into the circumstances and cruelty of inner city life in Houston’s toughest neighborhood only to end up in prison, a two-time felon, at the age of 16. Mack never denies his part in this tragedy, but is convinced that there are ways to keep others from making the same choices and break the cycle. Kids born into cultural depravity are making adult decisions, life altering decisions, at ages as young as 10. With that in mind, Mack is on a mission to teach every kid in America that when opportunity is rare and life’s not fair, preparation is the only way out of his or her snare. Because of Mack’s leadership for good in prison, he earned a reputation that gave him an opportunity to be mentored by a Faith Christian School family who attended the football game that launched this movie. He now lives with this family in Flower Mound and in seven short months he: has obtained his Driver’s license, has begun working, has bought a truck, is working on his GED, has become the domestic spokesperson for Touch A Life Foundation, which works to saves kids in Africa and around the world from slavery, has become a consultant on the movie One Heart. He has recently signed a contract with Kim Dawson Talent and Modeling Agency in Dallas. Mack’s Character is woven throughout movie. Carlos Beltran, at the age of 17, was selected in the second round of the June 1995 Free Agent Draft by the Kansas City Royals. He made his major league debut in 1998 and in his first full year in 1999, he won the American League Rookie of the Year Award. Beltran had dreamed of playing in the major leagues from the time he was 5 years old and promised his parents, “When I get to the big leagues, I am going to buy you a new home.” After the end of the 2002 season, Beltran and his wife Jessica, returned to Puerto Rico, and under the guise of buying the house for themselves, sought the parent’s guidance in selecting items for the house. During a family party on Christmas Eve, Carlos and Jessica presented the house to his parents. Sheila Burrell had a dream to be an Olympic gold medalist on the track. She had many of the tools that she needed to achieve her dream: athletic ability, the coaching and the desire. The only thing holding her back was a commitment to do her best. Sheila was a two-time representative of the United States at the Summer Olympics, competing in 2000 and 2004. Her best Olympic finish was fourth place. She also competed twice at the World Championships in Athletics, which included a bronze medal in 2001. She was also a two-time silver medalist at the 1999 Pan American Games. Her personal best for the heptathlon was 6472 points and she was American national champion on four occasions. “Even in moments of adversity, like the 2000 Olympics in Sydney, injury couldn’t stop Burrell from finishing. After hurting her knee and no-heighting on her first attempt in the high jump, Burrell completed each event, finishing 26th while earning the respect of opponents. Such character and competitiveness have spilled into Burrell’s coaching career, with stops at Cal State Northridge, Kansas State and Georgetown before she arrived at San Diego State. “In the end,” Burrell said, “the goal is always for us to finish top 25, win conference indoor and outdoor, and qualify as many athletes as possible for the NCAA finals. Fallon Taylor was blessed with both supermodel looks and world-class rodeo riding skills. During her pre-teen and teen years, she set many barrel racing records and earned more than $250,000. When she was 17, she gave up her barrel racing and moved to New York to focus on another career she had fallen in love with, modeling. But after six years of modelling, Fallon decided that she missed her barrel racing so much that she moved back to her parents’ home in Texas in 2004 to concentrate on both interests. Fallon broke her C-2 vertebrae in her neck in a horse accident in 2009 but after recovering from that went on to other rodeo successes. She won the World Champion Barrel Race at the National Finals Rodeo (NFR) in 2014. In addition to barrel racing she has also been a New York model and was the Axe body spray girl, made appearances on several TV shows including Two and a Half Men and started her own clothing company – ranchdressn.com with her two best friends in 2014. Think about what it takes to demonstrate commitment to what is right, to people, to the truth, and to doing your best. How will you use these examples to motivate your own commitment? John Maxwell tells the story of Michelangelo and the extreme commitment that it took for him to complete the painting of four hundred figures and nine scenes from the book of Genesis on the ceiling of the Sistine Chapel in Rome. Very likely we will not be asked to make a commitment of that magnitude. Maxwell says Commitment means different things to different people, “To the boxer, it’s getting off the mat one more time than you’ve been knocked down. To the marathoner, it’s running another ten miles when your strength is gone. To the soldier, it’s going over the hill, not knowing what’s waiting on the other side. To the missionary, it’s saying good-bye to your own comfort to make life better for others. To the leader, it’s all that and more because everyone you lead is depending on you.” (The 21 Indispensable Qualities of A Leader, pp. 16-18). Won’t you be the man that God wants you to be by showing commitment like Jesus did when He went to the cross for us?